The “B” variant of Lockheed Martin’s F-35 fighter jet is supposed to be able to take off close to vertically and hover. Getting it to work has been problematic since the jet blast is hot enough to melt the concrete it’d be parked on, but it sure does show up spectacularly to this heavy-duty thermal imaging camera. 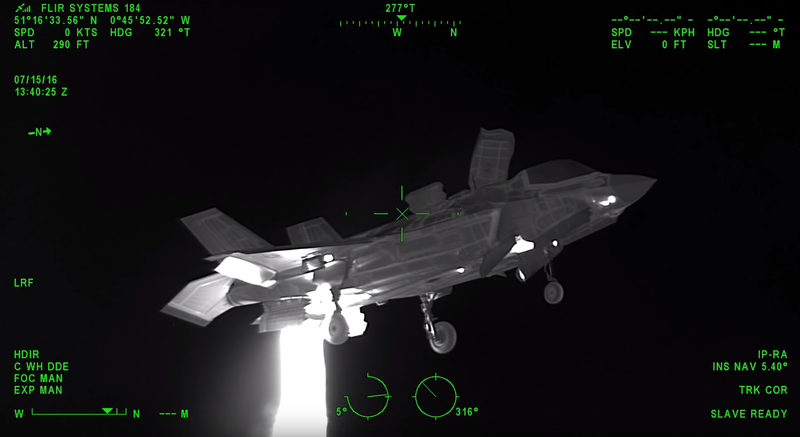 FLIR, a company that produces heat-seeing cameras for everything from cell phones to military vehicles, reports that they captured this F-35 in action at the Farnborough International Air Show with their 380-HDc camera. The 380 is a large (62 pound) remote-controllable device meant to be mounted on a helicopter. It feeds 1080p resolution video to the user highlighting heat anomalies as you can see in the video. The Royal Norwegian Air Force is scheduled to start using these cameras in 2017 on AW101 helicopters for search and rescue operations, as the tool can pick out a person from in icy fjord much better than the naked eye or plain zoom lens. How Did This Airstrike Hit Six Areas Of A Single ISIS Compound At Once?